Public VS Private WHOIS Data | Does it Impact SEO? In our recent post about domains: we have written in detail about domain history & how it can impact your SEO? But, with that, there’s also an SEO Myth whether to Keep your WHOIS Data Private or Public? The Internet Corporation for Assigned Names and Numbers (ICANN) is a non-profit organization responsible for coordinating the maintenance and procedures of several databases related to the namespaces of the Internet, ensuring the network’s stable and secure operation. An individual or legal entity wishing to register a domain name under a generic top-level domain (“gTLD”) may do so by using an ICANN-accredited registrar. 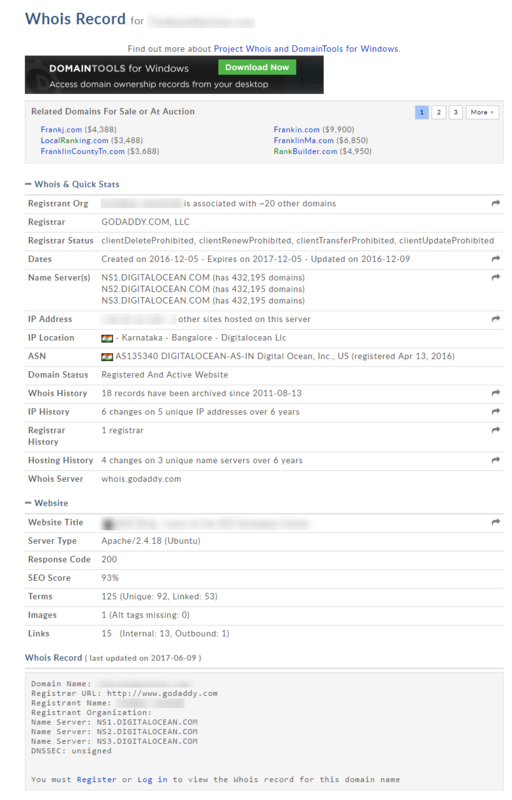 How to check WHOIS data? There are many tools available that allow you to get the information of a particular domain. While registering and entering your personal Information you have an option of keeping your WHOIS data public or private. If you have used the above websites to get information about a domain, you might have noticed that it gives out way too much personal information(like contact number & address) which is accessible to anyone who is looking up to that domain. Should we Keep WHOIS data Private or Public? Almost everyone has the ability to access the internet and anyone could potentially have access to your address, contact number, and email address. It is up to you if you want to keep your personal information public or private. If you don’t want unwanted solicitation from strangers, telemarketers and is concerned about your privacy and don’t want to reveal your information you can make it private. But when you want that additional protection for your domain, you have to pay extra money on top of the registration fees. Privacy protection price may vary depending on your registrar. Does domain WHOIS privacy affects SEO affords? Keeping your WHOIS data private or public doesn’t matter to Google. Keeping it private will not impact your rankings directly. Google itself is a registrar and can access the domain information of any website. Imagine a scenario where an Individual has 30-40 websites register under his name & all of their WHOIS data is private plus they are linking to a set of particular Domains? The situation is unrealistic but it is possible. Google will sense something is fishy & can penalise the website. Owning 2 or 3 domains with WHOIS privacy on it doesn’t matter. Keeping your WHOIS data private or public is totally up to the website Owner, it won’t affect your SEO. Previous PostPrevious Domain History: Does it Impact your SEO Rankings? Next PostNext Can Country Code Domain Limit Your Global Ranking?